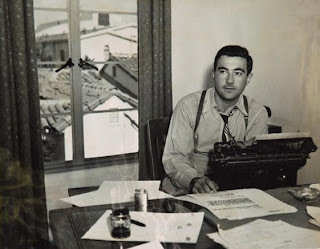 "It's surprising that pulp writer David Goodis never named a novel Cul-de-Sac," ponders Pacific Film Archives curator Steve Seid, "His stories conjure a dead end, littered with the wreckage of lonely losers and lowlifes. An ill fate befalls the typical Goodis fall guy, who often glimpses the high life, however fleetingly, but then through some irascible compulsion or sinister defect must stumble back to the seamy streets. Goodis's own life follows the same pattern: at age thirty, he saw his novel Dark Passage adapted for the screen and parlayed that into a contract at Warner Bros., but his questionable proclivities made him an outcast even in Hollywood. Back in his hometown of Philadelphia, he churned out paperback originals while prowling the seedy saloons with unguarded desire. At age forty-nine, he was dead of cirrhosis. Though Goodis persisted in relative obscurity, his works falling in and out of print, filmmakers mined his shady novels for their criminal content. Jacques Tourneur's Nightfall and Paul Wendkos's The Burglar were grim highlights of the American mid-fifties, while across the pond, cinema's continental ops found his soiled vision most suitable for their noir knockoffs. Truffaut's fanciful but faithful Shoot the Piano Player was the first in a lineup of a half-dozen suspects, all with a French accent. Goodis's pulp is not about plot; it's about the struggles of his beautiful losers to free themselves from sordid obsession and inbred failure. It's also about Goodis's smothering fixation with the fall—from grace, perhaps, or just from the curb to the gutter." 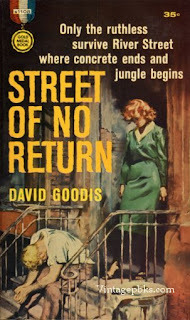 Whereas Steve Seid's curatorial involvement with the Gabriel Figueroa series might have been more administrative than creative, there's no question that the PFA program "Streets of No Return: The Dark Cinema of David Goodis" is Seid's bawling baby, as he revealed when he spoke briefly with me about the upcoming series. For general information on Goodis, check out his IMdb and Wikpedia profiles. Kelly Vance gets on the horn with Elliot Lavine who helps her assess the PFA series for The East Bay Express. Seid: The Goodis series; that's strictly me, my interests and my idea and doing the detective work to find the prints. Some of the joy of these series is hunting down prints. Guillén: Hunting down prints but also exposing audiences to the work. I became excited when I first read about the Goodis program because—though familiar with several of these films—I've never associated his name with these movies. It's a welcome opportunity to finesse individual talents involved. There's been quite a few essays written on how the current preoccupation with vintage Hollywood films, film noir, is somewhat fetishistic on the part of programmers and audiences. Do you agree? Is that how you think of it and how you're playing with it? Seid: No. I certainly read pulp and so—with Goodis—the film series came from the books first. I happen to like reading Goodis. But I agree with the fetishistic critique. 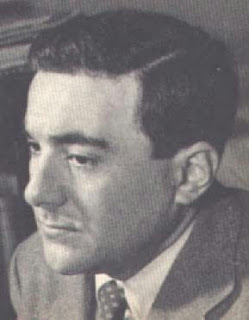 For instance, David Goodis is from Philadelphia and there are some fanatical people in Philadelphia who created Noircon. It's a bi-annual gathering of people who appreciate noir film and literature and these people are interested in a very different thing. Even though it doesn't announce itself in the program notes, I'm interested in what is included and what is left out when they translate novels to film. Guillén: What filmmaker David Lowery terms "the connective tissue." Seid: Yeah. Because there's a lot of fetishistic things within Goodis's writing that rarely make it to the screen. It's almost as if they sanitize a certain level of it. Even some of the movies that have a seeming seedy tinge to them are nothing compared to the novels. Goodis was kind of twisted, y'know? Guillén: How did you develop the idea of amplifying the films by having them introduced by seminal personalities like Barry Gifford, Eddie Muller, Nicholas Kazan, Elliot Lavine and Mike White? Guillén: And that counts for somethin'! Guillén: I imagine the series is going to be popular? Seid: I hope so. There certainly should be some interest from the press side. I'm also curating a program in the Spring—a miniscule version of the Goodis program—where I'm going to pair up filmic adaptations of different writers. There's going to be two Jim Thompson. Two Charles Willeford. Two Cornell Woolrich. Two Barry Gifford. Guillén: That's great! Bay Area audiences—having been festival-educated—are becoming increasingly aware of the collaborative efforts of cinematographers, screenwriters, novelists, and want the information to be fleshed out with retrospective biographies. Seid: And also that (a) the writers are often just forgotten; but, (b) the funny relationship with writers either actively writing the film script—and even that's twisted—or being turned away as only the novel inspiration and having no say in the transformation into film. The last Sam Fuller film—Street of No Return (1989)—is a Goodis adaptation. It was Fuller's very last film and I talked to the distributor in Paris but they wanted phenomenal amounts of money for the film. I mean, it was so high that I didn't even know where to begin negotiating because it was like three times what I would normally pay. Guillén: And why is that, do you think? Seid: They're kind of crooks. I hear that his experience with that film is really terrible with the people who controlled the money. It's an unhappy film. Goodis has also reappeared in print in the "Hard Case" paperback series. The covers alone have great retro artwork. I read The Wounded and the Slain last Fall. It's a great title mostly about a marriage coming apart. I wrote about Fuller's film a couple of years ago. Ah, you're beating me to the punch, Peter. I was going to link to those resources during the run of the series; but--since you've mentioned them--there's a great online gallery of vintage Goodis book covers and The Wounded and the Slain can, indeed, be found through Hard Case Crime books. Thanks for linking to your review of Fuller's film. Great piece! I've been called a lot of things but "seminal" is a new one for me.